This is the second in a five-part series from the Fronteras Desk called “The Costs Behind a Migrant Crisis.” Listen back to part one here. 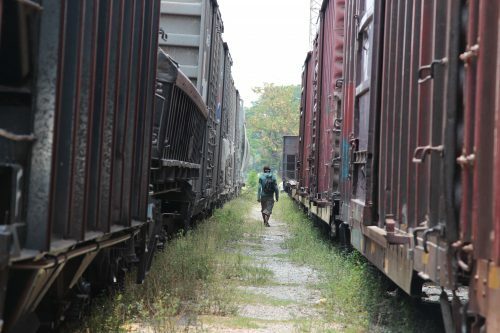 Starting July 2014, Mexico sent at least 300 immigration agents from other parts of Mexico to the South, raided trains and migrant hostels and set up mobile checkpoints. Washington is supporting this campaign with training, technology and intelligence. For migrants, the consequences have been profound. I came across a Nicaraguan migrant, Brian Chacón, in the southern Mexican border town of Tapachula, Chiapas, at a food stall. When Chacón entered, he shuffled his feet, looked down on the ground and then looked up and started asking diners for spare change to continue his journey North. “We are migrants from Nicaragua,” he announced softly in Spanish, addressing about a dozen people. He said that he was headed to the United States in an attempt to join relatives in Los Angeles. He told diners that he had started his journey in the Nicaraguan capital of Managua then headed through El Salvador, working there as a laborer. He claimed that he could not find work in Mexico because he had no documents. Other migrants interviewed for this story said they had found work as day laborers and would remain in Mexico until they could save enough to move on. Outside the diner, Chacón said he feared he’d be caught at the multiple checkpoints— both fixed and mobile— strewn across southern Mexico. Some of the mobile checkpoints were paid for by the U.S. “They [Mexican police and immigration agents] look for us because we are a trophy catch for them,” he said in Spanish. “They’re hunting us,” he continued. Deportations of Central Americans from Mexico rose by nearly 70 percent in the first 13 months of the southern border plan. Some believe that number comes at the expense of human rights. “U.S. involvement in the southern border of Mexico is worrying precisely because of how hidden it is, not just in terms of what the U.S, is doing but what Mexican authorities are doing with U.S. support,” said Clara Long with Human Rights Watch (HRW) in San Francisco and former Teaching Fellow at Stanford Law School’s International Human Rights and Conflict Resolution Clinic. “We’ve documented many cases of children who have tried to seek humanitarian protection in Mexico, have been met with detention, a lack of a meaningful opportunity to make their claims and been sent back to Central America,” she said. Neither government talks openly about their work in southern Mexico. Repeated attempts to speak officially with both the U.S. Department of Homeland Security and Mexico’s National Migration Institute, known by its Spanish acronym as INAMI, led nowhere. INAMI in Mexico City returned phone calls and emails, each time pledging to set up an interview, but ultimately to no avail. DHS did not respond. Adam Isacson is a security and border policy analyst at the Washington Office on Latin America (WOLA), a leading research group focused on the Americas. Isacson monitors security trends in the hemisphere. He explained why neither government wants to speak on the record. “There’s sensitivity about anything that looks like the gringos coming down and telling them what to do,” he said. Others have suggested that Washington does not want to divulge granular details about a campaign that the host country has no desire to acknowledge publicly. Isacson explained the genesis of Mexico’s southern border offensive. Here are two examples compiled by WOLA regarding the U.S. perception about the state of affairs on the U.S.-Guatemala border after the summer of 2014. Washington has committed at least $100 million to support Mexico’s southern border program since 2014. As of February 2016, $20 million has been delivered. And some who work that border are quite happy with the help they are receiving. A Mexican immigration agent agreed to discuss the matter, but only if her identity was not revealed, fearing retribution from superiors. She claimed migrants are receiving better treatment than ever before under Mexico’s southern border plan. She showed her credentials, was in uniform and arrived with a trusted go-between. “I’ve seen U.S. Customs and Border Protection officers here,” she said in Spanish. She said CBP agents work regularly inside a migrant detention center near the border known as Siglo 21, one of the larger migrant detention centers in Latin America. 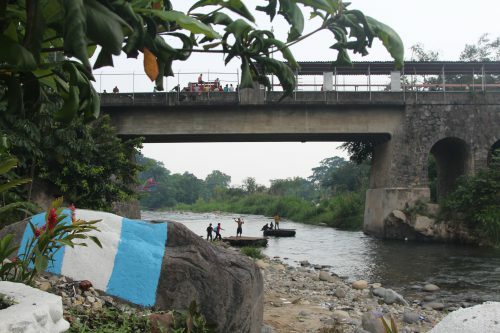 “Our border is easy to cross,” she explained, citing the geography of the region— a meandering river, the Rio Suchiate, that marks a large part of the Mexico-Guatemala border, mountains and forests. “U.S. agents come to interview migrants we detain,” after they’ve crossed the border, she said. “They can identify people we’ve deported before and that’s been crucial.” She explained that the U.S. is helping to collect data on migrants and migrant flows through improved fingerprinting techniques, among other initiatives. She also said that U.S. technology is more advanced than the tools currently at Mexico’s disposal. “That has really helped INAMI,” the agent said. Yet that support coincides with mounting allegations against some of her colleagues. 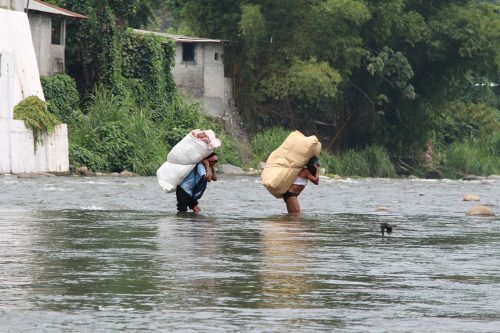 Mexico’s human rights commission says complaints of extortion and violence by immigration agents rose by 52 percent in year one of Programa Frontera Sur. 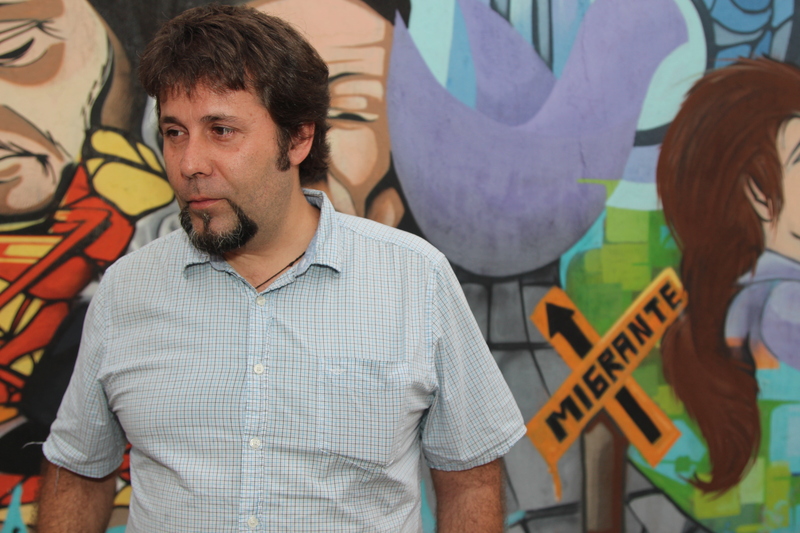 Human rights worker Diego Lorente is one of the few people not in law enforcement allowed into the detention center. He said he’s also seen U.S. personnel inside the detention center. He recently encountered a man that Mexican agents identified to him as a member of the U.S. Embassy’s staff at the detention center. Lorente said he asked the American directly if he could speak with him about a specific migrant case and described the response he received: “He made this sign with his finger,” Lorente recounted, drawing his index finger across his lips, indicating the American was not disposed to speak with him. Lorente said he glimpsed into the visitor’s office and saw a computer and desk, leading him to believe that this was not the American’s first visit to south. Citing the latest statistics, Lorente said the active U.S. support Mexico on the latter’s southern border complicates an already chaotic environment for migrants. “They are suffering much more now than they have in the last two or three years,” he said. If migrants do make it past the border and into the interior of the country, they must run a gauntlet— an alphabet soup of Mexican law enforcement agencies including immigration, police and the army. Yet thousands of migrants appear undeterred. Across the southern border region, you see groups of them in shelters, in buses and on the roads. Despite the dangers, Mexico’s remains a trampoline to the U.S. This entry was posted in KRTS News and tagged Border, Border Policy, Central America, Central American Migrants, Fronteras Desk, Guatemala, Immigration, Mexico, Migrant Crisis, migration, The Costs Behind a Migrant Crisis. Bookmark the permalink.